Linux distributions offer superb multilingual support, and with it, we can communicate with others around the world using a wide assortment of languages that are easy to install. Most English users, as well as many who speak other languages, have some form of the QWERTY keyboard, so what do you do when you wish to communicate by typing in a language that differs from your installed locale? Linux supports input methods that allow you to type in your chosen language. The correct fonts also appear. As an example of what is possible, you can mix and match several languages within the same text file, enter non-locale text in a search engine, or compose an email to a faraway friend in his native tongue. 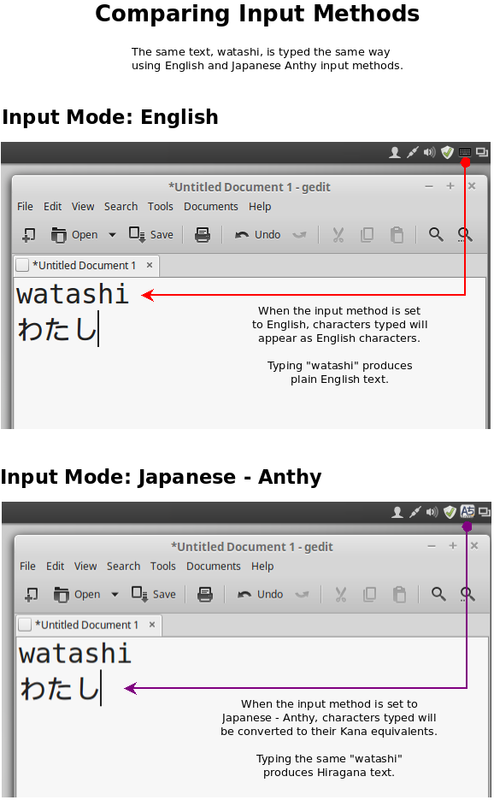 This updated article explains how to install support for the Japanese language on an English installation of Linux Mint 17.1 so we can type filenames, Internet searches, and compose emails from a QWERTY keyboard. The process is similar for most Linux distributions, and any language can be installed. In this example, we are using Linux Mint 17.1 (Cinnamon) due to its excellent language support, and Japanese was chosen since its typed characters look nothing like English. When we see Japanese text, we will know for certain that everything is working properly. Installing an alternate input method in Linux Mint 17.1 is not complicated, but it requires a number of steps. Here is a complete installation and usage tutorial with pictures. Are you seeking a lightweight Linux distribution designed for low-end systems? You are? Then, Elementary OS might be worth checking since it was designed to run fast on lesser hardware. I installed Elementary OS in VirtualBox 4.3.20 for a quick perusal, and I am quite pleased. Though it sports a minimalist design, Elementary OS offers enough to produce a fully functional Linux system that runs smoothly on low-powered machines. Over time, I have helped others with their computer issues and repaired and upgraded a number of Linux and Windows systems. As a result, I have noticed an interesting supposition: Linux has the potential to put you out of the computer repair business. “How can this be?” you might ask? Having been thoroughly impressed with Linux Mint 17, I was curious to see the features offered in Linux Mint 17.1. Linux Mint 17.1 features more polish and better user interface design among many other improvements, so does it match those expectations? I have been using Linux Mint 17.1 continually since its release in November 2014, and this is one of the best Linux distributions that I have used. Even though the new release is labeled “point 1,” do not let the 17.1 fool you into thinking that this is an insignificant bug-fix upgrade. It is more than that. The 17.1 updated versions of Linux Mint offer user interface enhancements, better system stability, and overall polish that make using Linux easier than ever before. Here is a computer term rarely heard these days: amp off. To amp off means to run in the background, and it is derived from the ampersand character (& or amp) placed at the end of a command line in a Linux or UNIX terminal.